I just love that cupcakes are so popular these days. The delicious, sweet, mini cakes make a beautiful presentation and are perfect for holidays, birthdays, company, dessert buffets, and more. 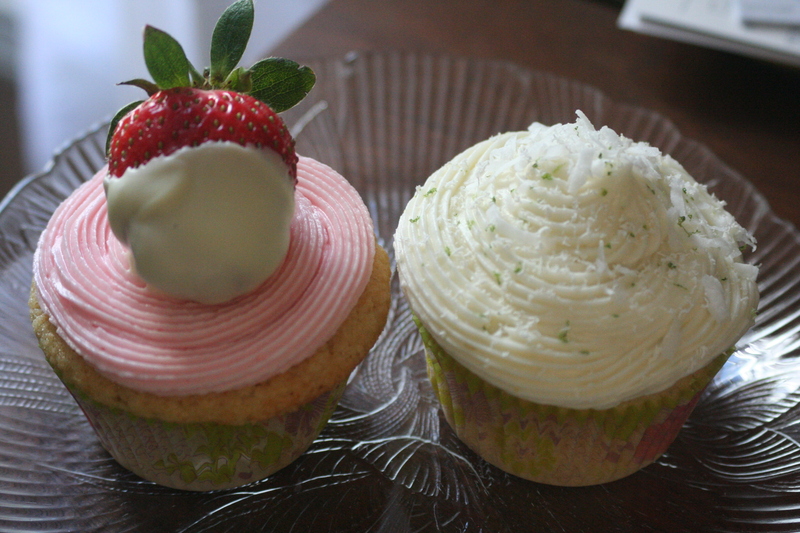 Today I'm sharing two recipes for homemade cupcakes. These key lime cupcakes are amazing. If you only make one of these recipes, make these. They are fabulous! I think they are probably my most favorite cupcake ever. Preheat oven to 325 degrees. Line muffin pans with cupcake liners. Using an mixer, cream the butter and sugar on high speed until light and fluffy, about 3 minutes. With the mixer on low speed, add the eggs, 1 at a time, scraping down the bowl after each addition. Add the vanilla extract, key lime zest and juice and mix well. In a separate bowl, combine the flour, baking powder, baking soda, and salt. In 5 parts total, alternately add the dry ingredients and the buttermilk to the batter, beginning and ending with the dry. Mix until just combined. Fold the coconut into the cupcake batter. Line a muffin pan with paper liners and fill each liner 3/4 full. A spring loaded 1/4 cup ice cream scoop works great for this and ensures the cupcakes are all the same size. Bake for 25 minutes or until the tops begin to brown and a toothpick comes out clean. Remove cupcakes from oven and allow to cool in the pan for 10 minutes and then transfer cupcakes to a baking rack to cool completely. Makes 14 cupcakes. While the cupcakes are cooling you can make the frosting. In a small heat proof bowl, melt the white chocolate in the microwave. Let cool until just slightly warm. Meanwhile, using a hand mixer, beat the butter until light and fluffy. With the mixer on low, gradually add the powdered sugar until well combined. Add the salt, vanilla extract, key lime juice, and sour cream and mix until very smooth. Add the melted white chocolate and mix just until incorporated. 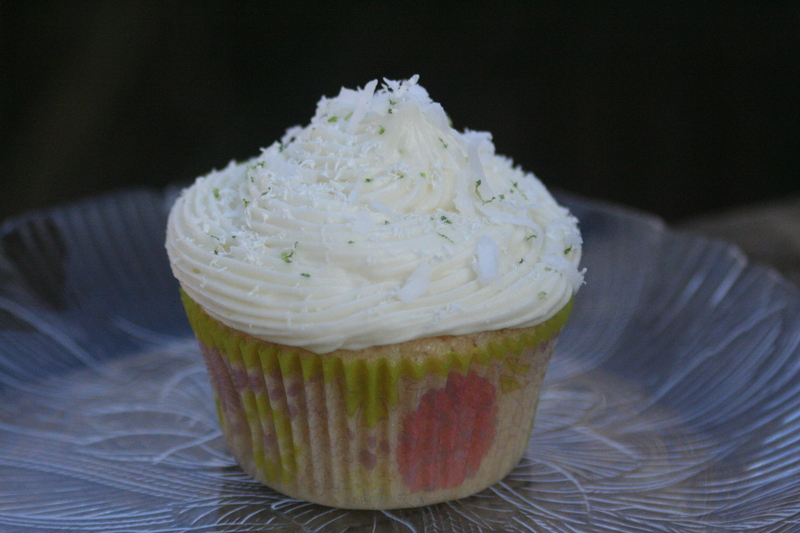 Pipe icing on to the cupcakes and garnish with sweetened, shredded coconut, shaved white chocolate, and grated lime zest. These vanilla cupcakes were moist and delicious! 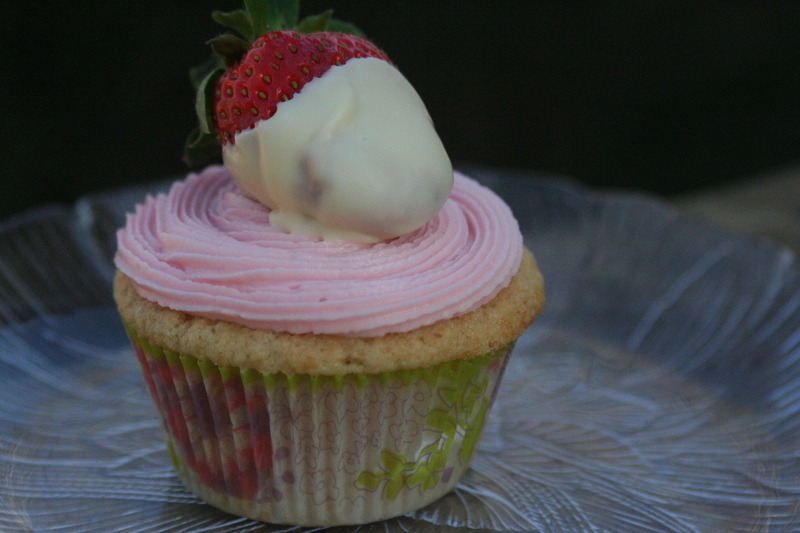 I used a simple vanilla buttercream to frost them and topped them with a white chocolate covered strawberry. My kids decorated their cupcakes with spring colored sprinkles. Combine in a bowl both flours, sugar, baking powder and salt. Mix on low speed until combined for about 3 minutes. Add in cubed butter, mixing until just coated with flour. Add eggs 1 at a time until combined. Slowly add milk and vanilla to batter until completely mixed scraping down the bowl as you mix. Scoop batter into baking cups filling about 2/3-3/4 full. Bake until a cake tester inserted in the center comes out clean, 17 to 20 minutes. Makes 24 cupcakes. Frost with your favorite icing. I made buttercream. Combine all with a hand mixer. Add food coloring if desired. Pipe or spread onto cooled cupcakes. I cannot say how absolutely BEAUTIFUL these cupcakes are!!! They look AMAZING!!! Thank you, thank you, thank you for posting these recipes! !